Congratulations to Habiba Asghar Ali who was selected as the winner of the Pakistan heat of the SDC International Design Competition on 3rd May at a prestigious event incorporating an international conference,and the judging. Despite tough competition from over sixty participants from eleven higher education institutions from across the country, Habiba, an undergraduate of National Textile University, Faisalabad was awarded first place for her winning design ‘Serenity’. 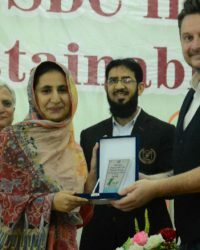 The successful International Conference on Sustainabe Textiles and the judging was supported by competition sponsors Archroma and attended by over four hundred people including Mujtaba Rahim, CEO Archroma Pakistan, The Vice Chancellor of UET Lahore and representatives from the top textile and fashion brands of the country. Andrew Filarowski, SDC Technical Director, presented at the conference by video link focussing on ‘Colour Education for the Future’ SDC’s education learning pathway and new virtual learning platform.